Perfect for February when you need a chocolate pick-me-up. This tart is very rich with a buttery crust and caramel-chocolate filling. This recipe comes from David Lebovitz, an awesome American pastry chef living in Paris. I've learned so much from my tarts of the month. I used to be afraid of making pie crust, but I learned last month how easy it can be. This is a whole new way to make crust that reminded me of the pâte à choux I used to make gougères, except with no eggs. This pastry has the same ingredients as any pie crust but the technique is totally different. Preheat the oven to 410 degrees. In an oven-safe bowl (pyrex works great) add the butter, water, sugar, oil and salt. Place in the oven for 15 minutes to melt. Carefully remove the hot bowl from the oven and add the flour all at once. It will sputter a bit. Stir it quickly to combine. Press the dough into a tart pan with removable bottom. It will still be hot so use a spatula to press it in. Press the dough across the bottom and up the sides of the pan. Poke it all over with a fork. Save a little bit of raw dough in case of cracks in the crust. Bake the crust for 15 minutes until golden. Mine cracked quite a bit so I used the reserved raw dough to fill in some of the cracks a little and all was well. Change the oven temperature to 350 degrees. To make the filling, sprinkle the sugar evenly over the bottom of a large, heavy pot and melt it over medium heat. Stir the sugar as it melts to cook it evenly. Be careful not to let it burn. Once the sugar is completely melted, turn off the heat and add the warm coffee. Be careful, the sugar will bubble up when the liquid is added. Add the butter and salt to the hot liquid and stir until smooth. Remove the pot from the stove. Carefully add the eggs and stir them in, then add the flour, then the bourbon. Bake for 15 minutes at 350 degrees until cracked at the edges but still jiggly in the centre. Remove from the pan and let the tart cool completely before serving. It's great with whipped cream. 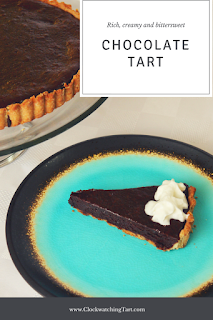 This tart is super rich but not overly sweet and the crust is crisp and buttery. A great treat for Valentine's day or any day. Enjoy!